Goverlan Reach Remote Access Software provides an auditing trail of operator actions as part of its security features. By default, all actions performed by a Goverlan operator are audited. This cannot be turned off. Audits are registered in the event viewer of the endpoint when an action is executed against it. For additional security of the audits, they can be centralized using the Goverlan Reach Server. 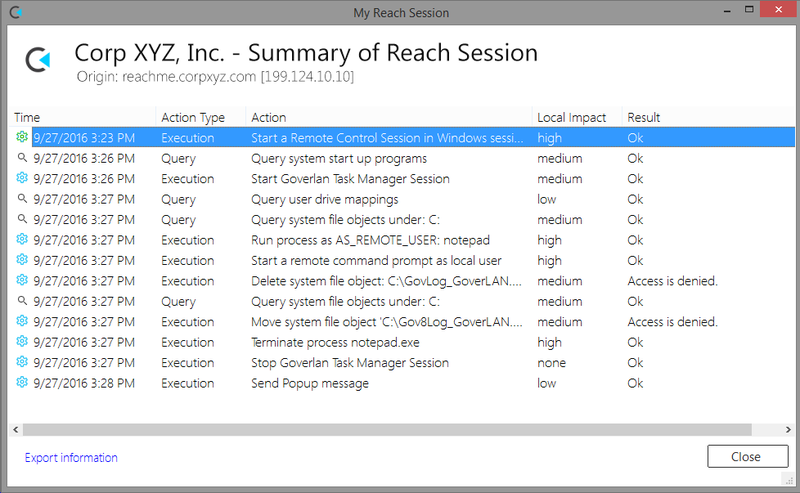 Every action executed on a remote system within the Goverlan Reach Operator Console is audited. This includes background system queries and executions as well remote desktop access. However, the actions executed within a remote desktop access session via the use of the mouse and keyboard and the command line executions within a Goverlan Remote Command Prompt are not audited. Operator Identity Identity information of the operator that executed the action. This includes operator ID and machine information from where the action originated. NOTE: Operator identity is masked in audits resulting from On-Demand remote assistance sessions. This is to protect your organization confidential information. In such audits, a section named Secure Data contains the operator identity in an encrypted format. This encrypted data blog must be sent to our support specialist to be decrypted. Medium – Actions that may have a medium impact on the local system or may represent a medium security risk (e.g., Map a Drive). High – Actions that may have a high impact on the local system or may represent a high security risk (e.g., Change Network Configuration). Action Information Full description of the action performed by the operator including parameters and results. Goverlan remote desktop access sessions generate additional audit traces in a separate log. These audits can be queried remotely through Goverlan. 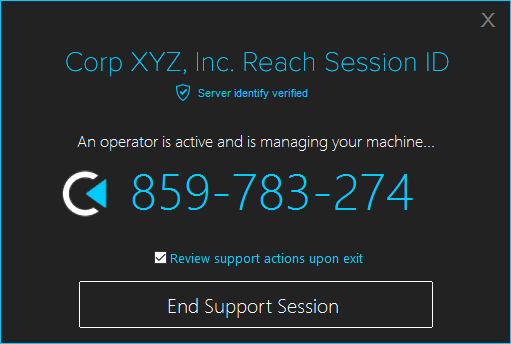 During an On-Demand remote assistance session over the internet, the assisted user will have the option to display all actions performed on his/her system during the session. To do so, the user must select Review support actions upon exit before clicking the End Support Session button. These audit traces are also located in the Application log of the Windows Event Viewer. 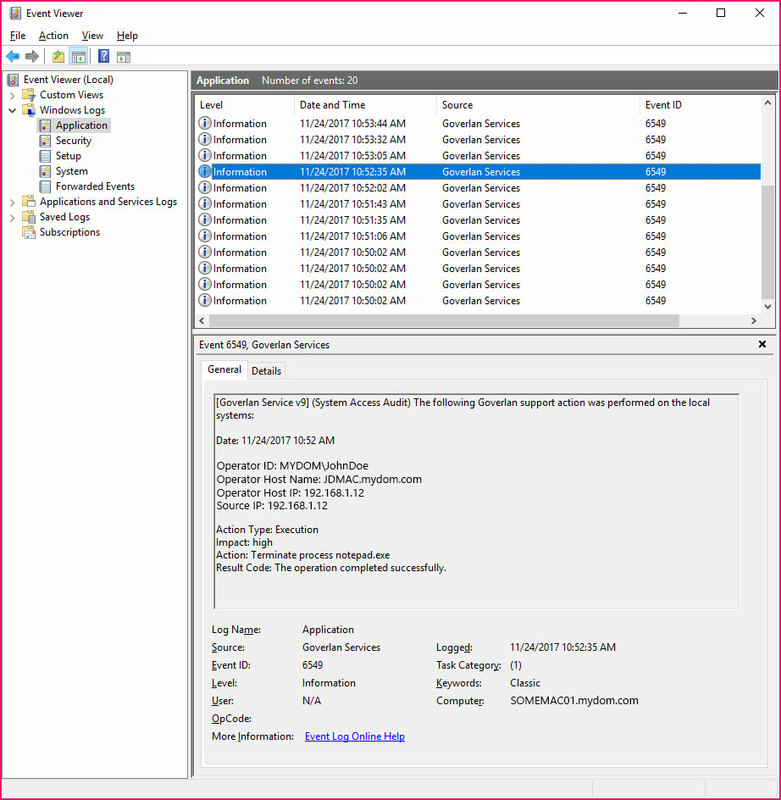 Event viewer audits can be removed by any local administrator. To secure your audits, you can centralize them using the Goverlan Reach Server – Auditing Services. Once configured, every audit generated by Goverlan are automatically registered to the Goverlan Reach Server. These audits cannot be removed.